Starting first of july 2016 Quiltshop 100 rozen develops embroidery patterns based on illustrations from Anton Pieck. 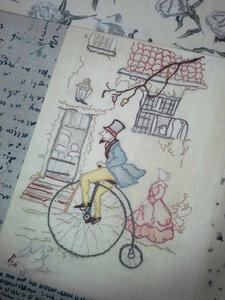 This first Pickwickian embroidery pattern is named Pieck on the bike (originally Pieck op de fiets) Its a small delight piece of work for stitchery lovers. The embroidery lines are printed on fabric so you are ready to start immidiately. And we also sell The colours of Anton Pieck DMC sets with the 13 colours you need to embroider Month 1, 2 and 3.